Once again we would both like to say a big “Thank You” for all your good wishes over the last seven weeks – yes, it’s seven weeks to the day since Marie was admitted. Marie’s wound is showing no sign of sealing up. It’s only a trickle plus the occasional rush, but even a trickle means no going home. So they’re trying a different approach. It would seem that you need muscle to mop up the fluids, and to replace muscle damaged by the infection, the next step is a muscle graft. There is an expert in that field available, but he works in Durham, so there is a possibility of a transfer to another hospital on the horizon. ... nowhere at the present. 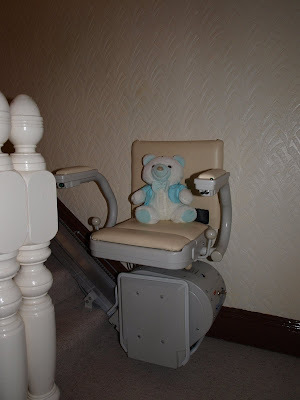 We've got a stairlift. Well, actually we've got two. If you know our house you will understand that we have two staircases, one long and one short, with the bathroom between them. Since climbing stairs is the one thing Marie won;t be able to do for the foreseeable future we looked around and I found someone who would rent stairlifts for a very reasonable price. So on Friday, Gordon The Tattooed Engineer came and installed them. This is the bottom one, modeled here by Thomas. Just a quick note to say that Marie had her surgery yesterday, and they gave her wound a “good wash-out”. Everything seems to have gone well, and Marie was in good spirits last night. She was tired, but there was none of the sickness that she often gets with anaesthetics. On Monday the Consultant will decide whether to leave Marie's wound to fix itself, or whether to go in and give it what he calls a "proper wash-out". Ant it's looking like the latter is the more likely course. The wound is still bleeding, but just a little. This is fine except that by yesterday the original site had healed, but it was bleeding from a slightly different place. On the positive side, Marie has a new little friend. Thanks to Jenny and Chris, a package arrived the other day, with this little fellow. Marie reckons his name is Frank, because he has blue eyes. He's cheered Marie up no end, so many many thanks. Marie saw the Consultant yesterday. It looks as though the infection has not gone away so it’s on to some new antibiotics and another week of wait-and-see. Of course, being the NHS, the antibiotics took eight hours to arrive. And if that doesn’t fix the problem it may be a trip back to theatre for another, more thorough wash-out of the wound, which could add another week. Needless to say we’re not at all happy, considering how close Marie was to getting home. 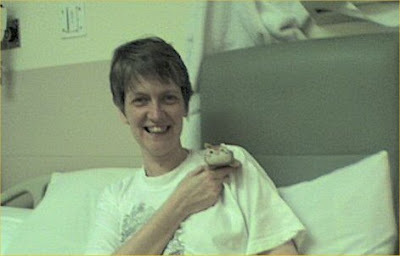 It will be five weeks on Thursday since Marie was admitted. On Friday the doctor told Marie that if her wound stayed dry for 48 hours, then she could go home on Monday. So what happened. It stayed dry all day Friday, then started weeping on Saturday morning. Actually it started with quite a gush. It's clean blood coming out, no pus or other unpleasantness, but still enough to delay things. Today things were a little better with very little coming out, but still enough to keep her in. The Consultant will be round in the morning so we'll see what he says then. Marie has had her surgery today and all seems well. When I arrived at just after 6 this evening she was sitting up in bed eating her dinner. Latest news is that - all being well - she hopes to be home sometime next. And finally, Marie sends a huge "Thank You" to everyone for their good wishes. The surgeon decided to go in and have a look at why Marie's wound has not sealed up. The operation is scheduled for Wednesday. As there is a risk Marie may still have an infection she is on last so they can give the theatre a good scrub down afterwards. So lots of waiting around for Marie. Thankfully it's only expected to take 30 minutes so hopefully she will be back by visiting time. 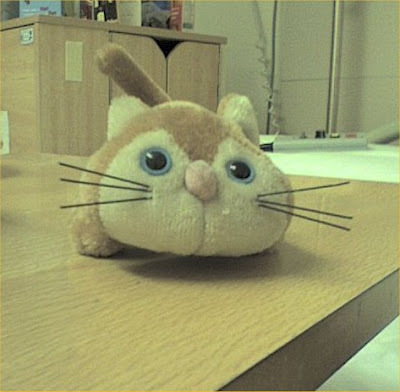 Marie has been passed as safe to go home by the physiotherapists. In the time available they can’t really do much more. It’s going to be a case of exercise and practice at home. She did however manage to walk a few steps with elbow crutches instead of a Zimmer frame yesterday. Also, the visit to the Occupational Therapist went well. They are satisfied Marie is not a danger to herself, and they can assist with some equipment to make life a little easier. On the down side Marie’s wound is still leaking. Just a little, and from one place only. No doubt caused by the anti-clotting drugs. The consultant is taking a look today and if he’s not convinced it will stop then he’s going to “go in and take a look” which could put homecoming back by a week. 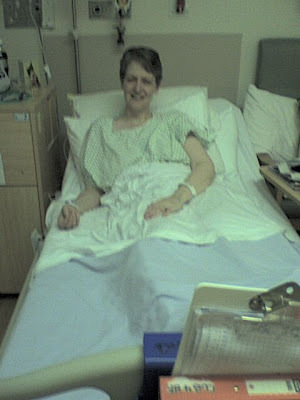 At last – Marie is rid of the line in her neck (cvc or central venous catheter if you want to be correct). It was very uncomfortable and made resting difficult. It also meant that she was hooked up to antibiotics for several hours, usually late at night or early morning. After an episode that was worthy of Kafka where one specialist wanted the line out because it was a risk if infection while the other wanted it in because they were still administering anti-clotting drugs which prevented removal, the consultant put his foot down. “It’s coming out today” her thundered. And when a consultant does this, people jump. So at last it’s out and Marie is on oral antibiotics. Ones that turn your wee red, and if you wear contact lenses it will turn them red too. Now that the lines are out, there’s more time for physio and Marie can walk with a frame and is allowed out in the ward without the physio provided someone walks with her. Now it’s just a question of convincing the O.T. that she’s safe to be let out.